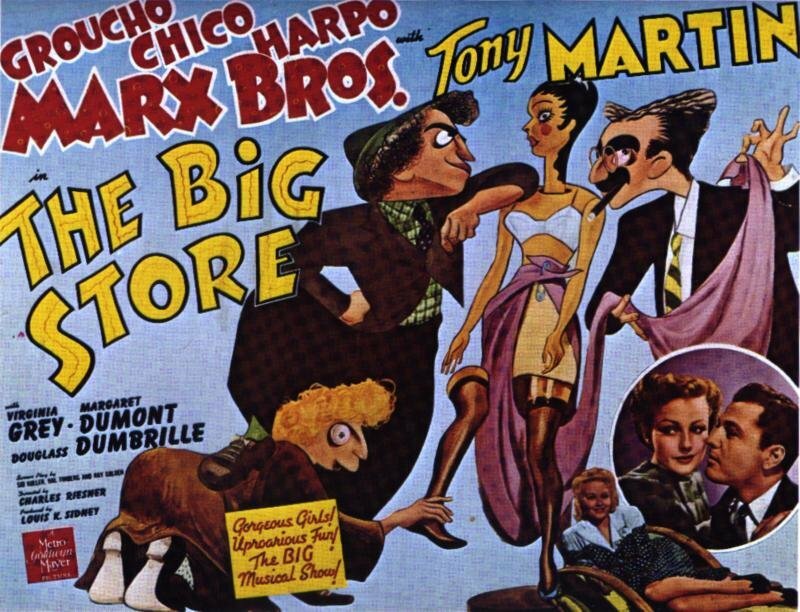 Singer Tommy Rogers (Tony Martin) has inherited a large department store. 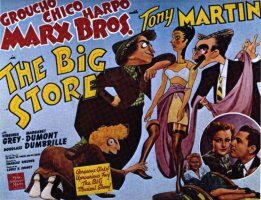 He plans to sell the store so he can build a new music conservatory for his friends "The Professor" (Harpo) and Ravelli (Chico). Mr. Grover (Douglass Dumbrille), the manager of the store, has been cooking the books and plans to off Tommy before he can make the sale. Once Tommy is deceased, his aunt Martha Phelps (Margaret Dumont) will inherit the store. It is Grover's plan to then marry Martha and take control of the store himself. Martha Phelps fears for her nephew's life, so she hires private investigator Wolf J. Flywheel (Groucho) to protect him. Along with his sidekick Wacky (Harpo), Flywheel takes the case. While there are not many truly memorable scenes in this film, it is still quite a hoot. Harpo is charming in an imaginary sequence where he dons Louis XIV gear and plays a chamber music concert with two mirror images of himself. Also, the chase scene near the end of the film is quite a riot, if you politely ignore the fact that it is obviously contrived and employs numerous "tricks" to get the gags across. This film was intended to be the Marxes' swan song. Harpo was to retire, Groucho to concentrate on his radio career, and Chico planned on putting a big band together. The brothers would get together for two more films, but not until U.S. involvement in World War II had come and gone and several years had passed. This was the last of the 9 films in which Margaret Dumont would appear with the Marxes. WOLF: Martha, dear, there are many bonds that will hold us together through eternity. MARTHA: Really, Wolf? What are they? WOLF: Your Government Bonds, your Savings Bonds, your Liberty bonds. Posters and Lobby Cards for this movie. Click to enlarge.